I'll go ahead and get the ancient joke over with. "Ward, you were a little hard on the Beaver last night"
Ha, ha, ha.......never heard that one before. Are those interested in this title getting the lunch box gift set or regular edition? I had planned on getting the gift set until I found out the DVD's were going to be housed in some kind of photo album. I now plan to buy the regular edition. I ordered the lunchbox from Amazon for $48.22. DDD has it for $48, but their free shipping is a lot slower and Amazon's packaging seems better. It's a gift for someone so the "gift set" seemed appropriate. If it was just for me, I would have bought the regular one. I wasn't able to find out how limited the LE is. The gift set seems fairly limited. I got the only copy ($48) at my local Wal-Mart (was up at the 8am store opening). Future shop only had 2 copies but at $56 CDN. Just a reminder to let everyone know that the series is on 3 DVD-18 flippers (very annoying with a 400 dvd changer). No extras whatsoever except for the original pilot which is quite bizzare compared to what LITB became. Picture quality is A+. The discs are housed in their own pockets in the photo album and are protected. No worry about scratches. Overall, the photo album is a very nice touch and the lunch box is of high quality. Any true LITB fan should seek it out! I Love it. 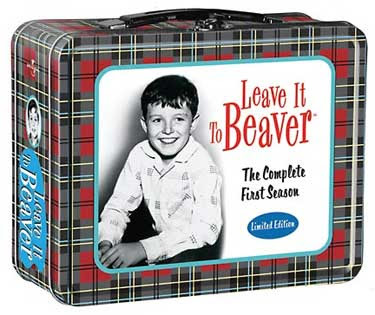 Re: Leave it to Beaver-Gift set or not? You can now find the lunch box at ebay for around $20 or less. A lot of sellers have it. Maybe it did not sell well? Or maybe they are unloading now that the Complete Series is coming to DVD.